since 2005, so it's been a long time since I've tasted refined sugar or butter, but tasting Sapodilla immediately brought me be back to that wonderful taste, with an additional hint of pear thrown in. 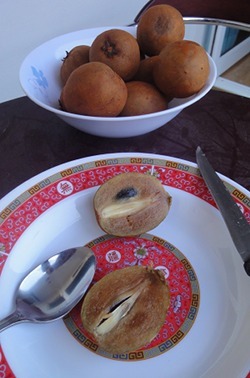 Manilkara Zapota is the scientific name for the Fruit we call Sapodilla. It originated in Mexico's Yucatan peninsula, where it grows abundantly in the the wild mangrove swamps and other areas. It's classified as a member of family Sapotaceae, making it related to mamey sapote, egg fruit (canistel), star apples, and and number of other fruits from the Americas. Although I'd tasted it in Florida, it wasn't until I came to Indonesia in 2010 that I saw just how amazingly abundant these fruit trees are. The evergreen trees often grow to more than 30 feet on farms and as high 100 feet in the wild, and are a lot of fun to climb and feast in. In season they produce what seems like an endless supply of fruit, usually broken up into two separate crops. 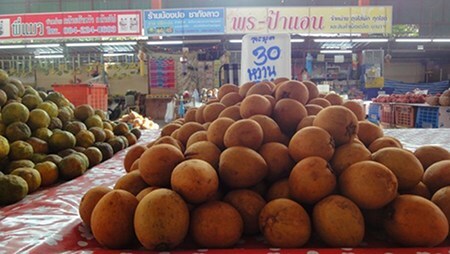 In Thailand, Sapodilla is a commonly-grown fruit and a favorite of farmers because its so resistant to molds and insects. Often they don't have to bother with chemical pesticides and fungicides. The fruit looks like a small potato, and varies in size from 1.5 to 4 inches in diameter. Especially when unripe, it's hard, highly astringent, and sappy with latex, but the astringency disappears as it ripens and the latex lessens dramatically (but you'll probably still notice it). You'll know the fruit is ready to eat when it's as soft as a very ripe kiwi fruit (giving easily to pressure). When it's ripe, the inside flesh should be dark brown. You'll usually find four bean-shaped black seeds inside, but the flesh. The flavor is like a malty pear dipped in butter and sugar, and absolutely delicious. If you get the chance, check them out. Although mostly grown in the tropics and subtropics and generally not shipped as part of the wholesale fruit distribution system of Europe and the US, you can find it at farmer's markets in southern Florida, where it grows well, as well as south of the border in Mexico. If you're a new raw foodist, you probably want to know about the caloric content so you can make sure you're hitting your caloric goals. The fruit has roughly 83 calories per 100 grams. To put that into perspective, the same quantity of cavendish banana has 85 calories. An orange has 49. In other words, sapodilla is quite calorically rich. Find more awesome fruits like Sapodilla. Check out this list of healthy and harmful foods.